Private transfer to Tortolì or independent arrival, overnight. An easy warm up day heading south exploring some of the best beaches in the area, Orrì, Cea and Cardedu to name a few. These are made of sand and pebbles, reddish rocks with a crystal clear sea and low Mediterranean scrub. After Barisardo, famous for its Aragonese lookout tower, you reach your base for the night located in front of a spectacular white sandy beach. Time to venture inland and explore the countryside. 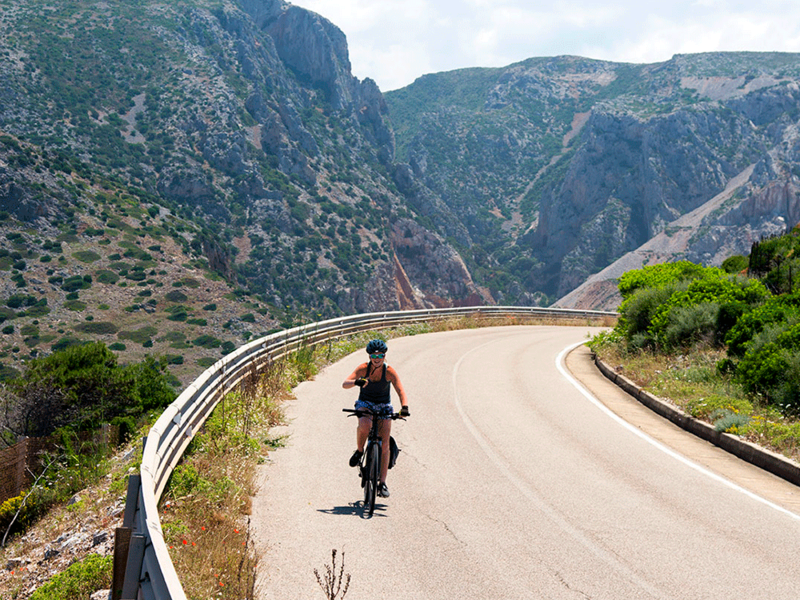 Ride up the Rio Pardu through olive groves and vineyards producing the famous Cannonau wine. As we rise to Gairo and Osini Vecchio, villages that was abandoned after violent floods in the middle of the 20th century, the first sequence of tacchi (heels) swings into view. These are imposing limestone rock formations that dominate many sections of Ogliastra. In Ulassai, visit the textile workshops and the caves of Su Marmuri. Some gorgeous views are today’s highlights. Deep gorges covered in holm oaks woods, shimmering walls outcrops of rock have been sculpted by the passage of time and erosion and one of Sardinia’s loveliest forests. Riding along a dismissed railway, you reach the small hamlet of Ussasai, whose origins and rural tradition date back to Neolithic time. Your deversed stop is Seui, a charming medieval village located at an altitude of 800 metres on the southern slopes of the Gennargentu massif. Riding away from Seui, you will reach the highest point of the trip and come across the majestic and well preserved Nuraghe Ardasai, a tower shaped megalithic edifice peculiar to Sardinia dating back over three millennia. 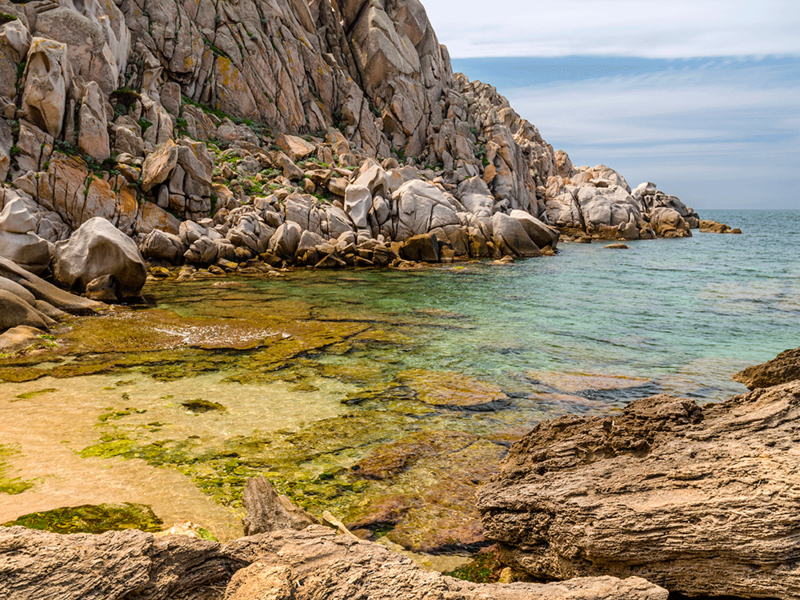 Looking North, you can admire Punta La Marmora, the highest peak in Sardinia (1834 mt above sea level). 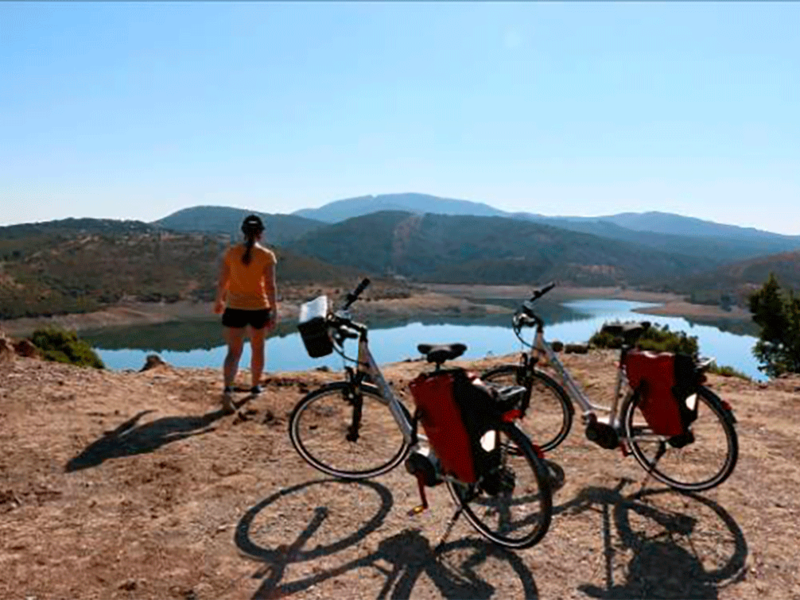 Cycling below the breath taking natural monument of Perda ‘e Liana, you reach the shores of the upper Flumendosa reservoir and then Villagrande Strisaili, one of the Blue zone villages with most centenarians in Sardinia. Find out why with a lovely dinner in your charming accommodation located in an oak wood forest. Back to the ocean! After the Nuraghic settlement of Sa Carcaredda, you reach the top of the climb. The spectacular view of the ocean from the top is the reward for the effort made. On the way to the coast, you pass Talana, renown for its prize winning cured hams. The fishermen village of Santa Maria Navarrese will be your base for the next two nights. Santa Maria is also the south entrance to the Golfo di Orosei, the longest stretch of Italian coast with no human settlement, 40 km of secluded sandy beaches interspersed by soaring white cliffs that are fantastic swimming spots.